Egg bands should be removed from trees before the caterpillars hatch. The forest tent caterpillar (Malacosoma disstria) is a pest of broadleaved trees and shrubs. Young caterpillars are black, hairy and about 3 mm long. They cluster together on the trunk or branches when they are not feeding. Mature caterpillars are about 50 mm long and are characterized by wide blue bands along the sides of the body and a row of whitish keyhole shaped spots running down the back. Although this species prefers trembling aspen, it is also found feeding on the foliage of birch, ash, maple, fruit trees and cotoneaster. During severe infestations the caterpillars will feed on almost any green leaves, including garden crops. 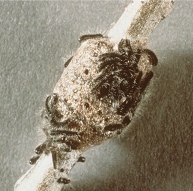 Heavy defoliation for two or more years can result in a decline in the health of a tree which makes it more susceptible to attack by other pests. For the urban homeowner, cultural control is the first line of attack against forest tent caterpillars. This consists of the removal of egg bands from infested trees and shrubs. The egg bands are easily detected between fall and leafing out in spring when the leaves are absent from the trees. Once discovered they can simply be scraped off with a dull blade. Laboratory analysis of egg bands shows a significant impact of parasitic wasps on the hatching of forest tent caterpillar eggs. So rather than discarding those egg bands, leave them somewhere outdoors above the winter snow levels where the caterpillars will starve, but the tiny wasps can complete their development. If some egg bands are missed or are inaccessible, clusters of caterpillars can be removed by pruning or washing down with a strong jet of water. Small caterpillars will rarely manage to recover from this, while larger ones can be controlled individually by physical means. Keep in mind that light defoliation has little effect on tree growth.